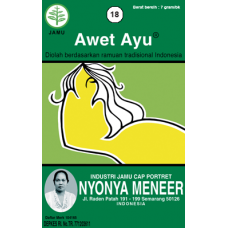 Awet Ayu - 10 Sachet - No. 18 : Herbs For Healthy, Clear Complexion, smooth skin. Powder, serbuk. Jamu Awet Ayu keeps the female body fresh and healthy. It regulates menstruation and prevent vaginal discharge. It renew the body's energy, and keeps the skin healty and young. Recommended Dosage: Take 1 sachet every morning and evening, especially following one's menstrual period. Package: One box (contains 10 sachets per box).